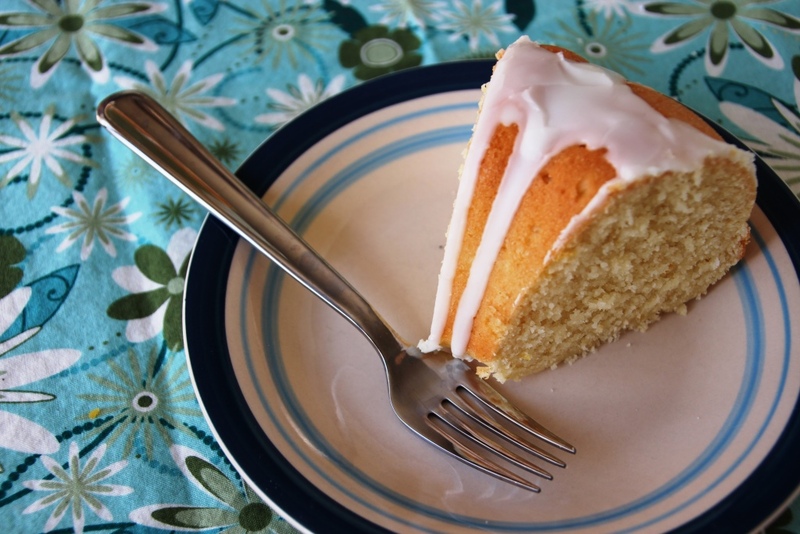 Hello my friends, I’ve been busy attempting to find a lemon cake to share with you guys. 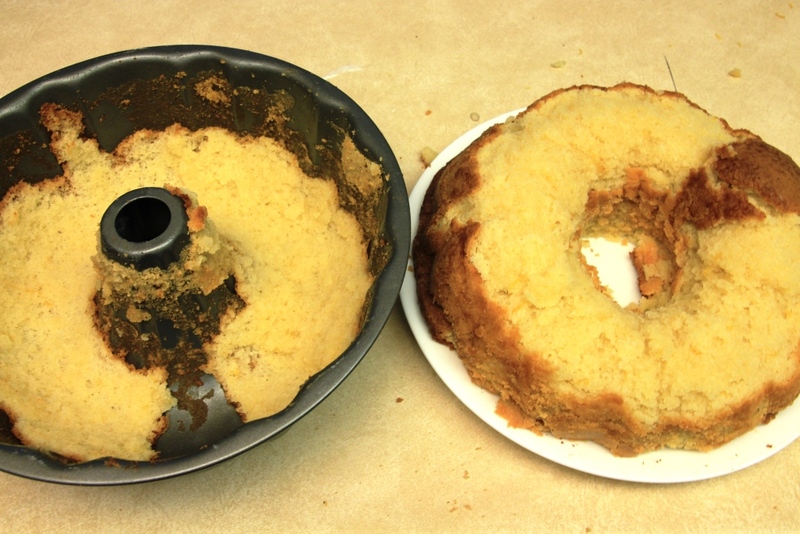 As mentioned last post, attempt #1 was rather a fiasco, resulting in an overflowing, collapsed mess that was somehow over-baked and under-baked at the same time. And to top it off, it failed to cleanly come out of the pan. The following week I tried again, using a new recipe. This recipe baked beautifully but was not quite as lemony as I prefer. I like lemon desserts to smack you in the face with lemon rather than leaving you wondering if that was really lemon flavored after all. And so this weekend, attempt #3 was meant to boost the lemon flavor from the previous week, which was successful, finally. 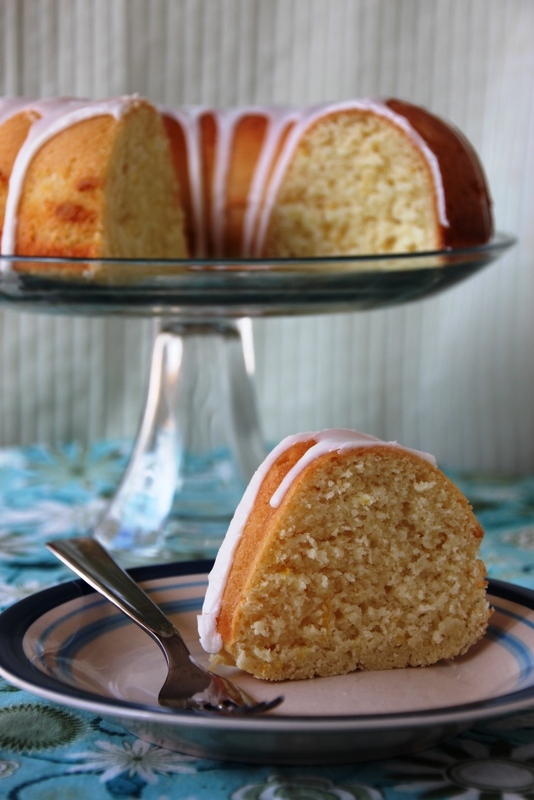 I finally present to you a fully lemony bundt cake for your springtime pleasure. If, like me, you’re ignoring the attempts at snow outside and the chilly wind, and looking longingly towards the blue patch of sky, bake this cake. This morning was a rather gray day, with flurries of now, but as I type up this post it’s now sunny and nearing 50 degrees. Obviously the weather gods approve of lemon. Fairly dense but not sickeningly sweet, the lemon scent permeates the air even before you have a taste. The color of sunshine guarantees a smile even on a cloudy day, and the burst of flavor leaves no questions about its contents. Although I love a strong lemon flavor, I realize it’s not for everyone. If you prefer it a bit more subtle, leave out the syrup step entirely. If you want the experience to have a bit more ka-pow (definitely a technical term), the syrup will give you that. Add as much or as little of it as you like, but make sure you poke deep holes into the cake to allow the syrup to permeate all the way through, or you’ll be left with a soggy bottom/middle that sticks to your wire rack. 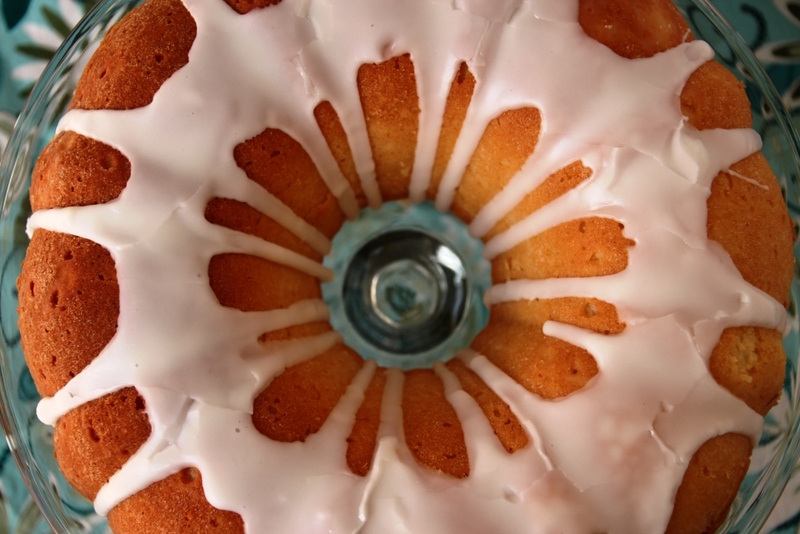 Don’t be afraid of the holes, they won’t show once the cake is inverted. 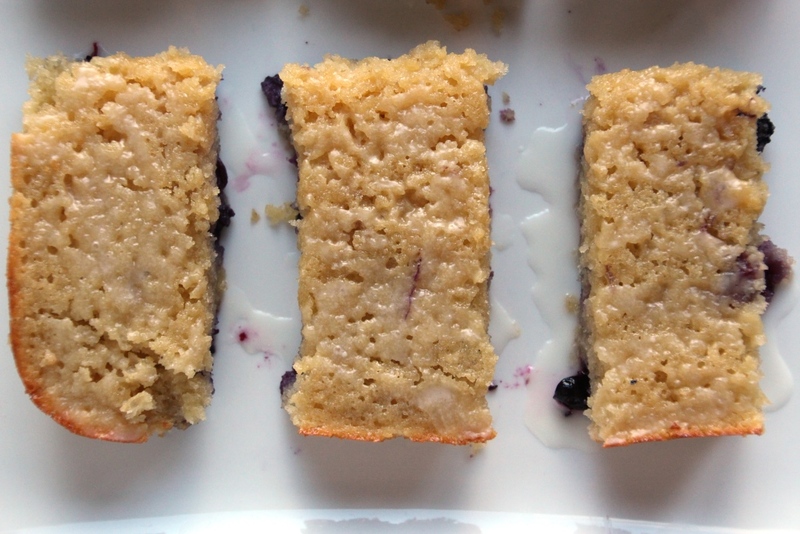 This is an easy cake, and although a teensy bit time-consuming, it’s very beginner friendly. 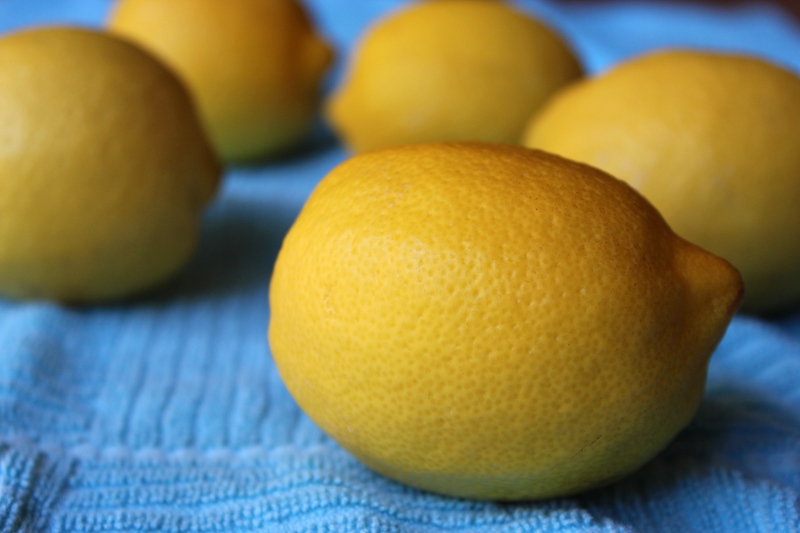 It would make a delightful addition to any table, sure to please any lemon fan. If you do decide to forego the syrup step, I recommend using a thinner glaze than shown here so you can cover the entire cake. 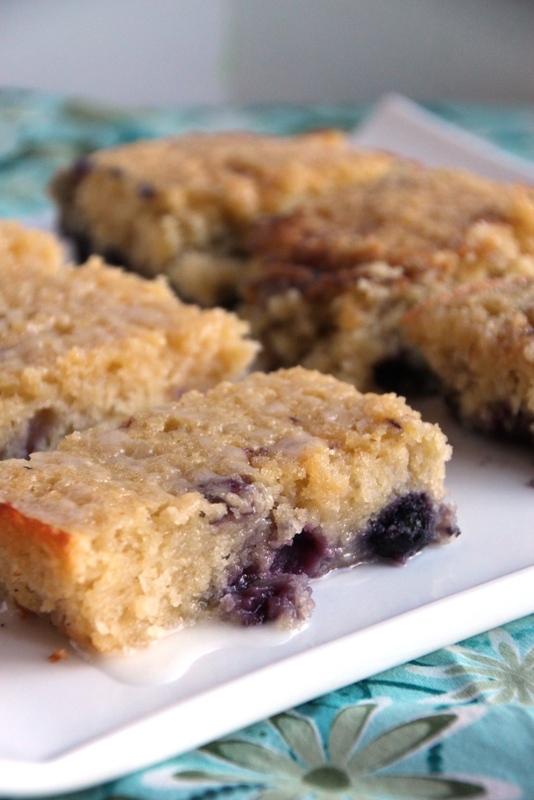 The glaze is a necessary complement to the plainer cake and this will ensure you have some with every bite. Preheat oven to 350 degrees Fahrenheit. Butter and flour a 10+ cup bundt pan. In a large bowl, beat butter and cream on medium speed until lightly colored and fluffy. Add eggs one at a time, beating until just combined between each one. Add one third of the flour mixture and beat until just incorporated. Repeat with lemon juice, one third of flour mixture, buttermilk, and remaining flour mixture (in that order), stirring just until incorporated with each addition. Scoop into prepared pan, gently smoothing out the top. Bake for 40-45 minutes, or until a toothpick comes out mostly clean. During the last 10 minutes of baking, heat 1/4 cup lemon juice and 1/2 sugar to boiling, then remove from the heat. 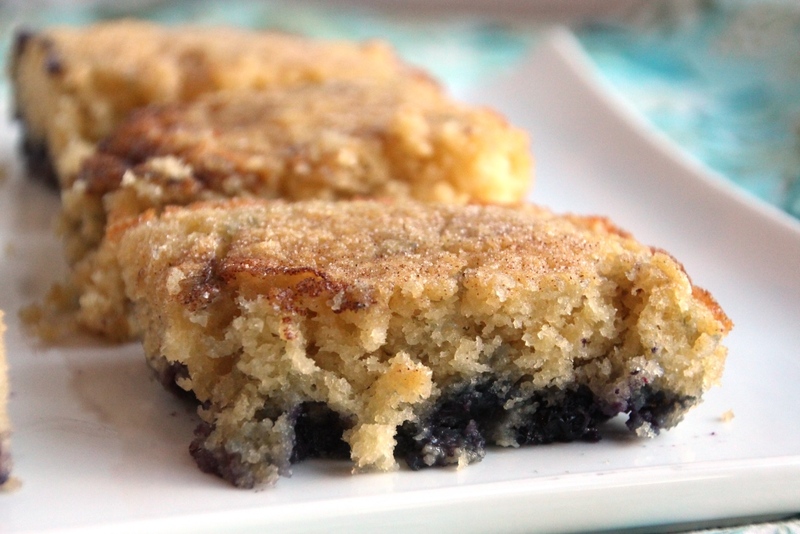 Immediately after removing from the oven, poke deep holes in the bottom of the cake, and slowly pour the lemon syrup evenly over it, letting it soak into the cake. Cool in pan for 15 minutes, then carefully invert onto a wire rack to cool completely. 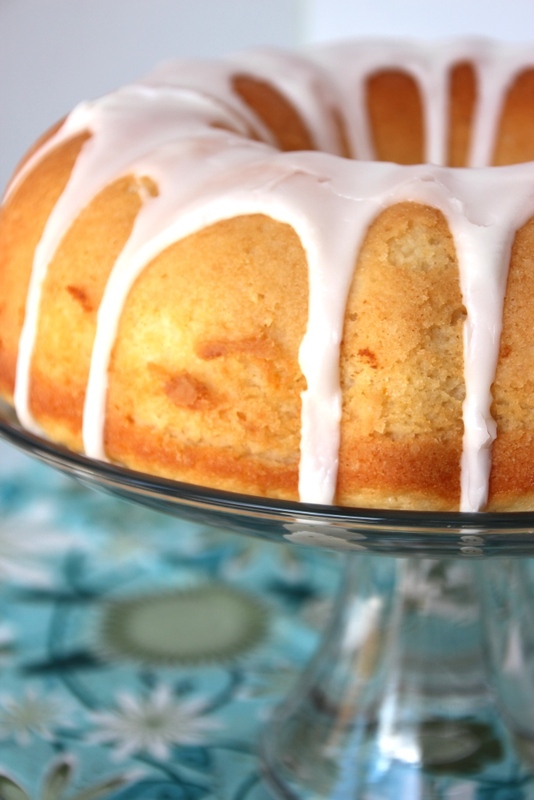 After the cake is cooled, vigorously stir together powdered sugar and lemon juice, adding more or less of each to desired consistency, and drizzle over the cake. Let the glaze set 20-30 minutes, then serve on its own or with a scoop of vanilla ice cream. 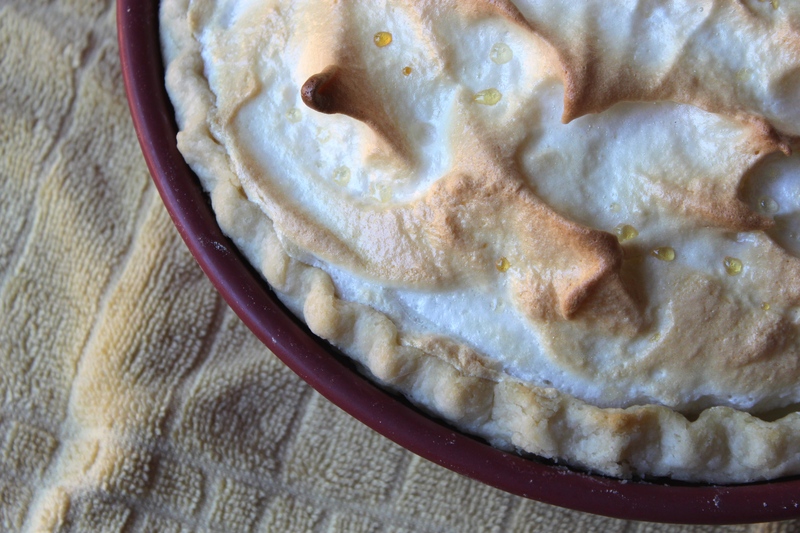 This week we return to the lovely summery flavor of lemon, since I successfully created a lemon meringue pie this time. As both a citrus flavor and a chilled dessert, it makes for a great summertime treat, although it’s equally delicious any other time of year. 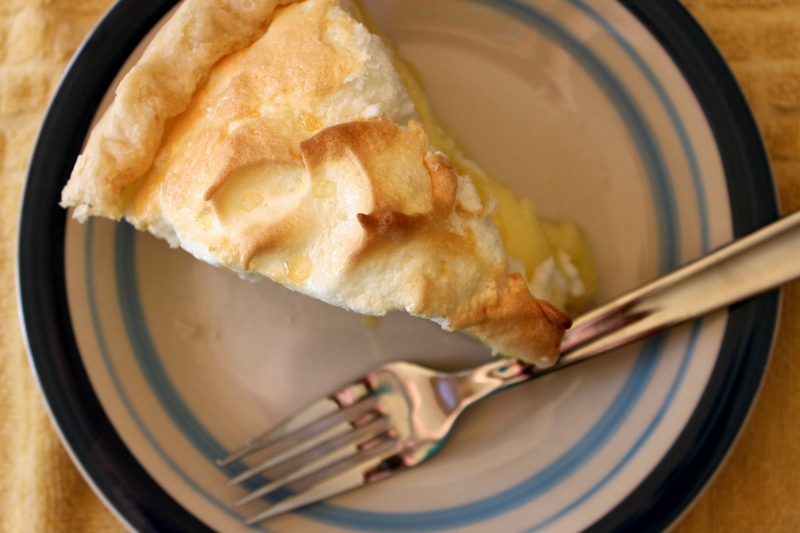 Lemon meringue pie was the favorite of my maternal grandmother, and I made it for her birthday a couple of the years I was there to celebrate with her. Her birthday conveniently falls on Pi Day, the day before my own birthday, which make a lovely two days of meringue pie (lemon for her, chocolate for me.) Although she passed away last year, I still intend to celebrate Pi Day with lemon meringue for many years to come. Perhaps the most easily screwed-up pie I’ve ever made, lemon meringue can be a daunting task for even an experienced pie baker. The easiest way to screw it up is to not cook the filling long enough, causing it not to set correctly in the fridge. It’s extremely important to heat the filling to a full rolling boil and then cook and stir for another minute or so; if in doubt go an extra thirty seconds just to be safe. The instruction list is fairly long, but I have laid it out in the order I find to be most successful for me. I recommend reading through the entire list before starting to make sure you have everything easily accessible. The success of this pie relies somewhat on timing, and taking too long (or not long enough) between certain steps can result in a liquid filling or the meringue completely separating from the crust. Place pastry in pie dish being careful not to stretch the dough. Trim and crimp edges. Prick pastry GENEROUSLY with a fork, all over the bottom and sides of the pan. Bake for 8-10 minutes, or until golden brown, and then cool on a wire rack. Reduce oven heat to 375 degrees, and move oven rack to bottom third. Using an electric mixer on high speed, beat egg whites until soft peaks form. Gradually add the sugar and corn starch, mixing between each addition to medium peaks. Leave in mixer bowl and start the pie filling. In a medium saucepan, whisk together sugar, cornstarch, water and egg yolks. Heat over medium heat, whisking nearly constantly until mixture thickens and reaches a boil. Continue cooking, vigorously whisking until mixture is very thick and smooth, approximately 1 minute. Remove from heat and stir in butter, zest and lemon juice until smooth. Gently place the meringue over the hot filling, carefully sealing the edges completely. Swirl the meringue into peaks using a spatula or the back of a spoon. Bake for 10 minutes or until peaks of meringue are lightly browned. Cool at room temperature for about thirty minutes, and then place in the fridge for at least 3 hours before serving. I don’t like long strings of zest in things, so I generally chop it pretty fine before adding it to anything. Pricking the crust before baking helps keep it from shrinking, so don’t be afraid to stab excessively. Egg whites whip best at room temperature, and make VERY certain there is no water in the bowl or on the whisk/beaters before starting. It is very important to cook the filling well. If you don’t, it will look thick when you pour it in the crust, but end up as liquid after it chills. Make sure to keep stirring and heating for another 60 seconds after it boils. Unfortunately, this pie will not keep long so invite some people over to help you finish it the day of baking. (It will keep one day in the fridge alright but after that the meringue doesn’t keep its light and fluffy consistency. Around the beginning of April, the weather in Montana gives everyone a brief taste of Spring before retreating back to second winter (and third and fourth and fifth…) with a cruel laugh. Or maybe I’m personifying the weather a bit too much. But regardless, it is those first few hours of Spring that turn my thoughts to the flavors of summer, starting with lemon. 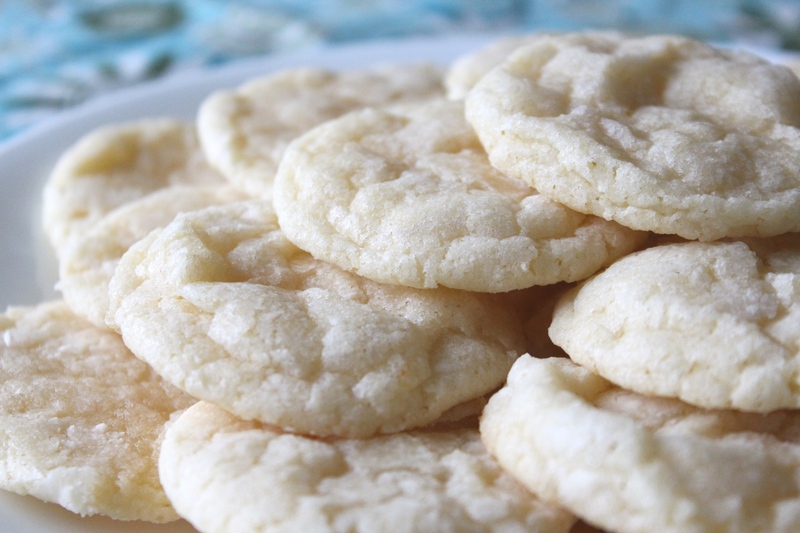 Over the past few years I’ve looked for a go-to lemon cookie recipe, and struggled to find one. 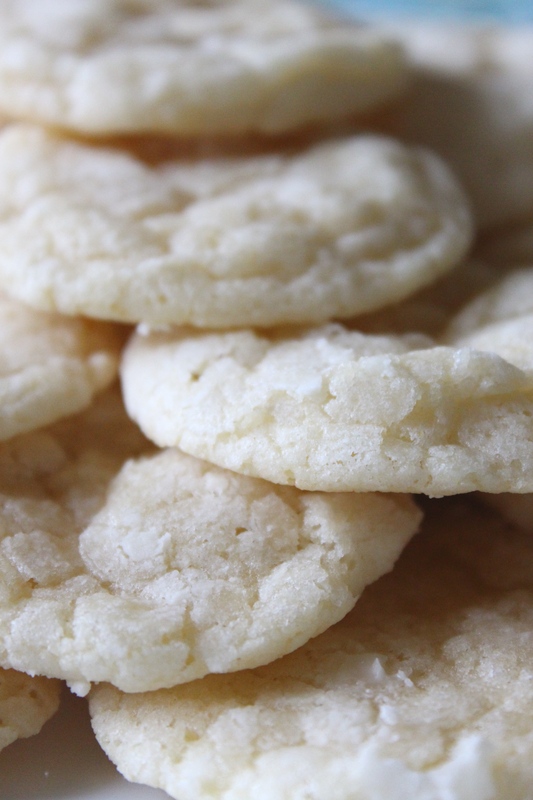 I wanted a soft, lemony cookie that didn’t require a glaze or start with a cake mix. It took awhile, but I finally found a great one. 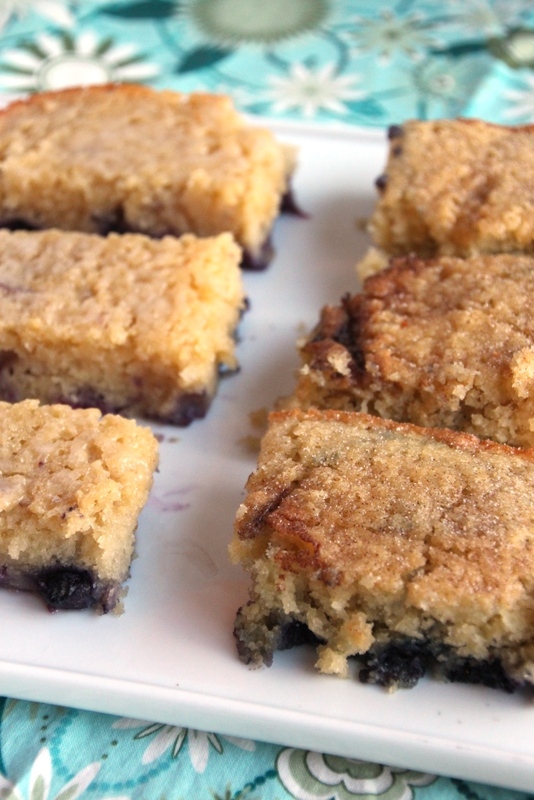 The lemon taste is present but not overly powerful; the cookies are soft and chewy, and there’s no cake mix involved. Even better, other than a lemon, it’s all standard ingredients. 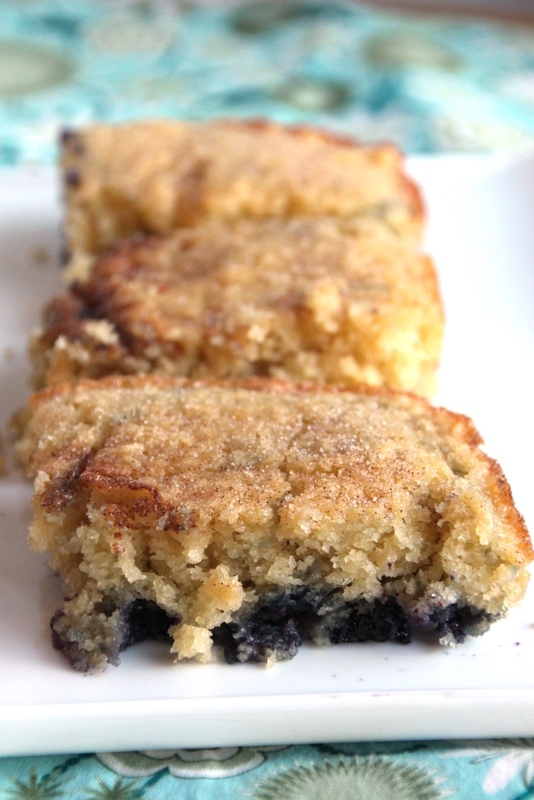 The recipe is below with my [very minimal] changes and the method I followed to bake them. I hope you enjoy them as much as I do. Line two cookie sheets with parchment paper or silicon baking mats. Pour powdered sugar into a shallow bowl or large plate. Cream together butter and sugar until light and fluffy; this will take a few minutes. Meanwhile, combine vanilla, egg, lemon zest, and lemon juice in a small bowl and whisk the remaining dry ingredients in a separate small bowl. Beat the wet mixture into the sugar/butter until well mixed, scraping the sides at least once. Slowly stir in the dry ingredients until just combined. Scrape the sides and mix again briefly. Roll a tablespoon of dough into a ball and then roll in the powdered sugar. After all the dough is rolled, (I put all mine on a plate), place in the refrigerator while the oven preheats, or at least 15 minutes. When the dough balls are chilled, bake for 7-11 minutes, until the cookies are no longer shiny or melted looking, and the bottoms are barely browned. Let the cookies cool on the sheet while you fill the next batch and put them in the oven, then remove to a cooling rack to cool completely. I got about 34 cookies from the recipe, using a tablespoon cookie scoop. I used the juice from half a Meyer lemon, but next time I’ll use the whole lemon to give a slightly stronger flavor. I found that when the dough wasn’t chilled, some of the cookies turned out very flat and had overly browned edges. 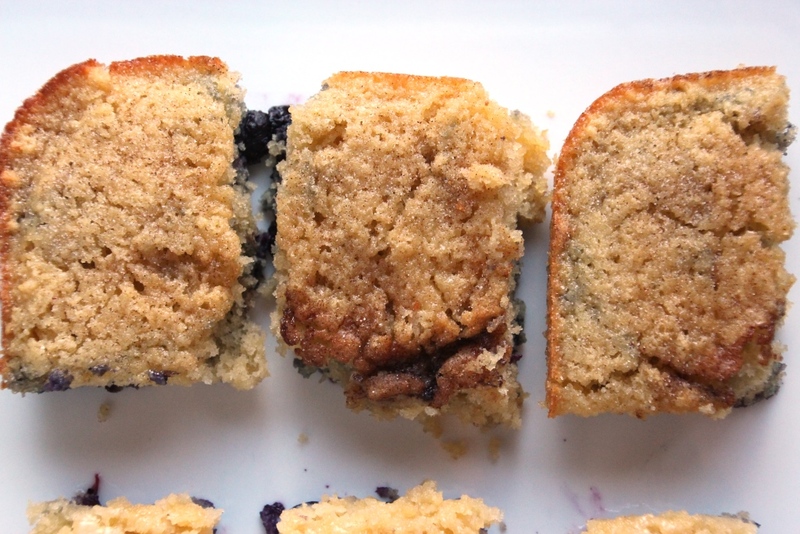 The darker the cookie sheet the less baking time required. I used light-colored silicon mats on dark pans and my cookies needed 10 minutes.